Finding your roof’s pitch is an important factor to know when you are ordering and planning your Exhaust kits to go with your Standard Tools and Equipment Paint Booth. Here’s how you can find your roof pitch. 1. Measure 12-inches on the level & mark. Mark the length with the marker. Many levels are equipped with a ruler on the side, but marking it will allow it to be more visible. 2. Climb up to the top of your roof. · Make sure the roof is not wet or icy. It is best to walk on a roof when the sun is out and morning dew has evaporated. · Make sure the ladder does not damage the gutter or side of the roof. · Ascend the roof. Crouch down or sit, as to minimize the potential for slipping. · You can measure pitch from any spot. · Pull out your tape measure about 1 foot or so. 3. Use your level to measure the roof run. 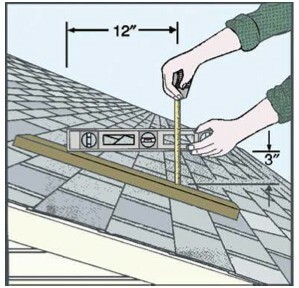 · While holding the tape measure with one hand, pick up the level with the other and place the bottom corner on the roof. · Using the level’s corner as your pivot point, hold it parallel with the ground. · Pivot it up or down until the horizontal vial’s bubble is between the two lines. 4. Measure the rise with the tape measure. · Hold the level parallel to the ground and measure the distance from the roof’s surface to the level’s 12- inch mark. · Make sure you rotate the tape so it is perpendicular to the level. Write down the rise. 5. Calculate the roof’s slope. The number you measured with the tape is the roof’s rise or pitch — the amount the roof’s height rises over 12 horizontal inches. For example, if you measured 3 inches, the roof’s ratio will be a 3:12 pitch. (See illustration). Previous Previous post: You Want to Ship a Paint Booth Where? International Paint Booth Shipping. Next Next post: Get Off Your ‘But’ ….